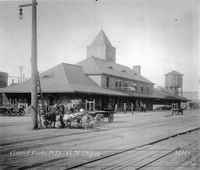 Before designing the Bismarck Depot, Gilbert had designed railroad depots in the Shingle, Old English, Germanic Medieval, and Italian Renaissance styles. 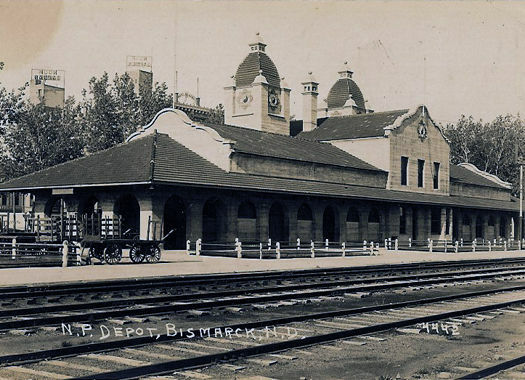 The Bismark Depot is Gilbert's first Mission-style design. Typical of Gilbert, he did not introduce the style. Appearing on the architectural scene about 1895, the Mission style was still in its infancy when Gilbert began his experimentation. He was quick to grasp that the diversity of image generated by different architectural styles was an important component in the "sense of place" that depot architecture demanded. Following the time-honored massing of railroad depots, the central portion of the building is two stories, flanked by one-story wings. Missing is the traditional wide overhanging eave on the track side, but in its place is an arcaded porch at either end that is unified by the arched windows in the building's main block. The greater height of the waiting room is expressed in the central volume of the building by gable-end walls that project above the roofline. The simple austerity of the surfaces and towers lend a "provincial" quality to the building. The bell-shaped roofs of the towers derive from Moorish influence on Medieval Spanish architecture and reveal Gilbert's deep knowledge of architectural sources and his willingness to explore them in his work. Portions of the towers that are not Spanish suggest the influence of Richardson.